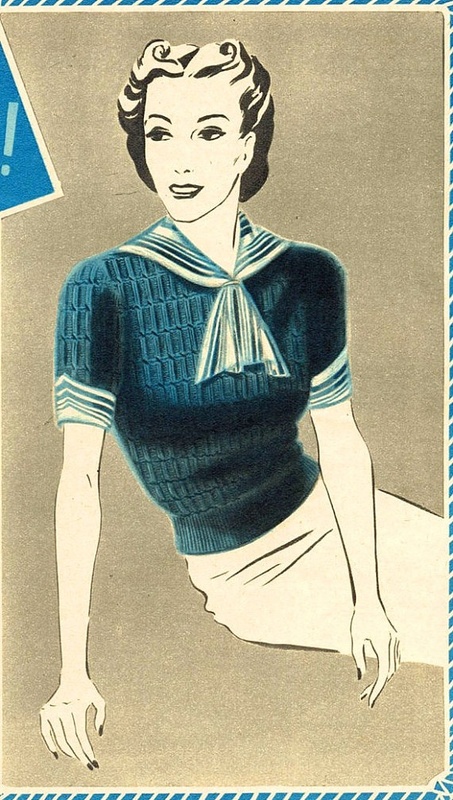 Sailor sweater, oh I WISH I could knit sometimes! 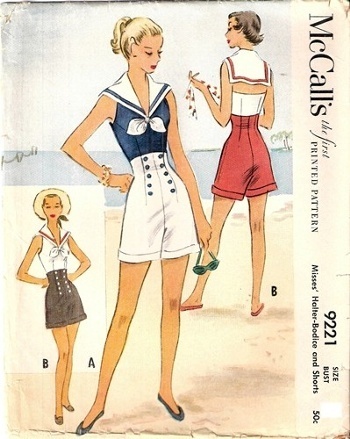 But for a real taste of nautical chic, there's nothing quite like the winning combo of striped Breton top and high wasted sailor shorts. And brown legs of course, if you're lucky! Just in case I get an invitation to mess around in a boat this summer, I've decided to make myself this very same winning combo. For the shorts, I'm going down the denim route, inspired by these beauties. For the Breton style top there was only ever one contender - the Coco pattern. I used an unusual green and cream striped stable knit from the Goldhawk Road, which is a lovely quality knit. I went for the ¾ sleeve option and also shortened the body length quite a bit. I do like the original length of the Coco top with the split, but wanted something that wouldn't be too bulky tucked in. 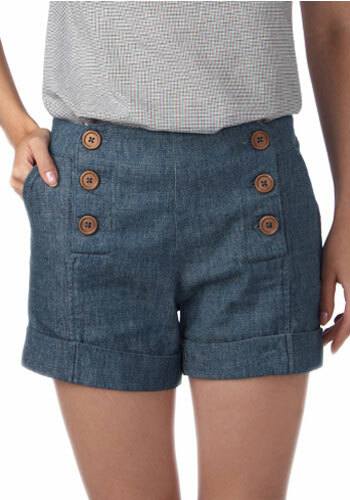 The shorter length also means it can showcase any awesome sailor buttons I manage to scavenge for my shorts. I tapered the waist and hips in by about ½" for a more fitted look and also reduced the width of the sleeves. I love the nautical trousers. I have been wondering about an overlocker, recently. I'm not a big wearer of separates (unless they are band t-shirts), but this might be just about the most perfect top I've ever seen. Looks fab on you and can't wait to see the shorts! This look is so you! I don't think anybody does nautical as well as you do! Oh, I love your inspiration shorts! They are perfect, and I'm sure yours will be too. You should get the buttons that Scruffy Badger used recently on her Coco, where you sew on the anchor shape. I think they would be the perfect final touch! 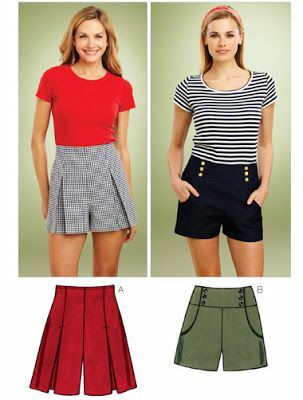 The epitome of sailor chic jane!! Love it and your green cream stripe has come up very well as a coco. Now the shorts....very much looking forward to seeing them too with your bronzed pins. Your coco is gorgeous and the shorts look like they'll be wonderful! i love it! can't wait to see the shorts! GAH! I love those trousers! And more fabulousness paired with the breton style top! Okay, I admit, I get a bit giddy over the nautical vibe too! Such a fun post...me, with my pale legs...kindred spirits, we are! Great imspriration shots, And a lovely Coco, looks fab. Cannot wait to see it paired with your sailor shorts and new tan! It looks lovely. The nautical look really suits you. Love the green alternative to blue, great outfit! Ahhhhhhhh! So cute! Now you just need a seaside vacation to go with your outfit! Despite living near the sea I've never really favoured the nautical look (not a perquisite to wear it of course!) but I have to say you're in danger of converting me with this combo! Love this outfit!! Looking forward to seeing your denim shorts with this Coco! Looking forward to the shorts. Remember how most legs look pale in the beginning of simmer. Looks fab, shame the hems were such a pain. Can't wait to see the shorts though! 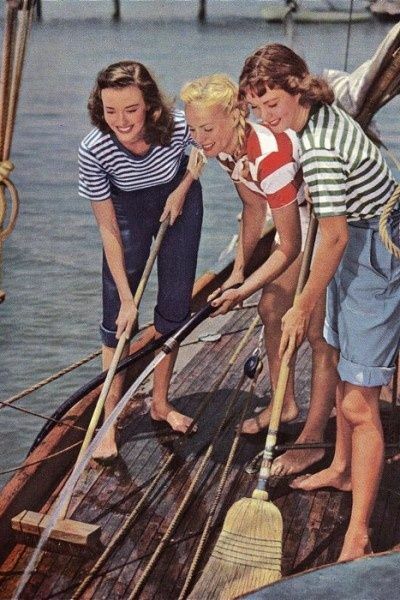 I love nautical fashion inspiration! You look great!